Facebook has officially launched its location based service called Facebook Places in collaboration with the current big players of the field, Foursquare and Gowalla. The service was unveiled in a press ceremony at the Facebook headquarters yesterday where CEO Mark Zuckerberg revealed that they had been working on the project for the last 8 months and now it’s ready to roll out. The iPhone app for Facebook places is up and running. If you don’t have an iPhone, you’ll have to use the Facebook touch mobile site on a browser that supports both HTML 5 and geo-location to use the service. The company does plan to roll out Android and BlackBerry versions of Places, but they haven’t released any specific dates yet. Representatives from Foursquare and Gowalla were also present at the event and explained how they plan to leverage Facebook’s new Places API. Both will allow you to check-in and publish the data to your Facebook feed. Your badges and pins from each of those apps will transfer over as well. Yelp and Booyah are also launch partners for this new API. Booyah is actually making a new app called InCrowd, built on the Places API. With Yelp, you’ll be able to transfer your check-ins both to and from Facebook. Facebook CEO also explained that the service does not aim to reveal users’ location to the world but helps them find places and share them with friends. All necessary privacy tools have been added to the privacy settings page which let users control who gets to see their check-ins. 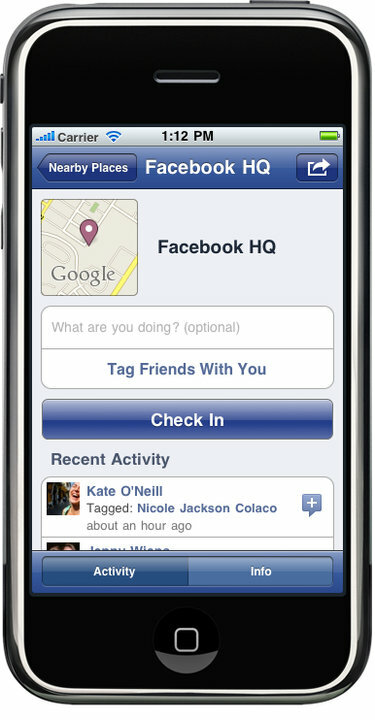 Users have the option to share their location with friends only and a new feature not available in other location services allows them to tag friends too who are with them at the time of check-in. You are allowed to open it up to the world if you want and even opt-in to a “People Here Now” feature that shows other nearby Facebook users, whether they’re friends or not. The service is limited to the US only currently and will be rolled out internationally in the coming days.